Islamabad: Ever increasing population in South Asia is eating natural resources and putting pressure on the already overburdened food production resources and this situation is becoming graver due to climate change in the region. Increasing population is growing demands for food while climate change is decreasing production—developing an alarming imbalance in Hindu Kush Himalaya region. Most projections suggest that more extreme weather events and increasing rainfall variability will lower agricultural productivity in South Asia. 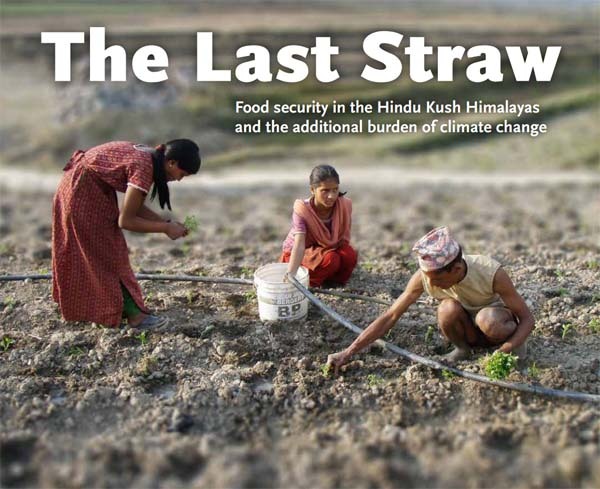 A new publication of International Centre for Integrated Mountain Development (ICIMOD) titled “The last Straw: Food Security in the Hindu Kush Himalayas and the Additional Burden of Climate Change” is worth reading report dealing with climate change and food security issues. Adequate water availability (through irrigation system or rain) during specific periods of agriculture production is the foremost demand for a better harvest. Climate change is changing scenario and Himalayan glaciers will release more water in the next 10–20 years, followed by a gradual decrease in most major river basins. Rain pattern is also varying due to climate change and there will be significant variations in water pattern across the region and future water supply will be less predictable. Himalayan water towers will discharge less water over time, rainfall will increase. Conditions for food production and livelihoods in general will depend greatly on the balance through the seasons between glacial melting and rainfall. Most projections suggest that more extreme weather events and increasing rainfall variability will lower agricultural productivity. “Climate change impacts on food security will vary across the HKH. Pronounced trends in the HKH indicate warming and drought-proneness in China and the Koshi basin, increased winter water stress in South Asia, high variability in monsoon and flood related disasters in the Upper Indus and plains of other basins, and warming in higher altitudes in all basins. All these trends present a high risk to agriculture. The extensive decrease expected in storage capacity will affect water supplies for agriculture, hydropower potential, and other uses. Food insecurity has the greatest impact on those people in the HKH region who are socially, culturally, economically, or otherwise marginalized, in effect a majority of the mountain dwellers”.